When Apple first introduced iPhone, defective Home buttons were not uncommon. Because it is used so often, the Home button could be damaged from overuse. The problem is so prevalent that Apple introduced Assistive Touch – an on-screen button that serves as an alternative to the physical Home button. Another alternative the Home button Touch ID which uses your finger print to unlock your device. With the update to iOS 10, Apple now requires users to press the Home button to unlock their iPhones. Many are frowning on this change because of concerns that it could affect the Home button’s durability in the long run. 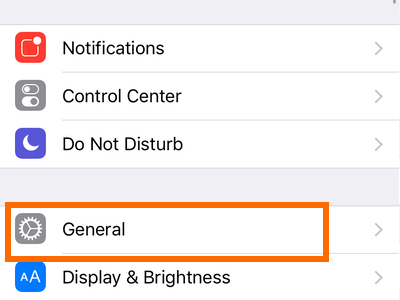 This tutorial explains how you can disable the Press Home to Unlock option on iPhone and enable Rest Finger to Open (Touch ID). 1.Go to your phone’s Home screen by pressing the Home button once. 2.From your Home screen, go to Settings. 3.Under Settings, scroll down to the General options. 4.In the General screen, tap on Accessibility. 5.Scroll down once you are on Accessibility. 6.Tap the Home Button option from Accessibility. 7.Enable the Rest Finger to Open option by turning its switch ON. Now that the Rest Finger to Open option is enabled, you simply press rest a finger on the Home button to unlock your screen. This method requires that you register to iPhone the finger you use. Tech-Recipes has a tutorial that will show you how to register more fingers to unlock your iPhone. Share your tips and tricks for unlocking your iPhones so other people may benefit from your knowledge. If you have questions with any of the steps above, drop us a message in the comments section below so that we or some of our helpful readers can help you.